In case your accident was a result of the negligence of the truck driver, you have the right to file for a compensation for your losses. Negligence can be defined as a condition when someone fails to take the required level of care in performing an operation which ultimately causes an accident. It includes actions like speeding, distracted driving, failing to comply with hours-of-service requirements, and driving under the influence of drugs or alcohol. In most of the cases, you will find a truck accident case to be easy to settle. This is the very reason most of the people think that hiring an attorney is of no use in the case of a commercial truck accident. However, the reality is far from this. In most of the cases, the commercial truck companies have professional insurance experts defending their cases. These professionals are dedicated to making sure that your claim is decreased to the minimum value and if possible declined completely. You being a novice, cannot defend their argument and fail miserably to get the compensation you deserve. Because commercial trucks are heavier and larger than cars, any accident involved with them result in grave injuries. While they can be fatal in nature, if someone is lucky, he/she may survive with a few injuries that may or may not cause permanent or temporary disability. For this reason, an expert attorney will be able to advise you correctly as to the level of claim that you should file. To ensure you enjoy a successful endeavor in compensation claim you need to hire an expert attorney who understands the process and has enough experience to carry you through. For an experienced personal injury lawyer in New Haven, Cirillo legal has years of experience dealing with commercial truck accident cases. 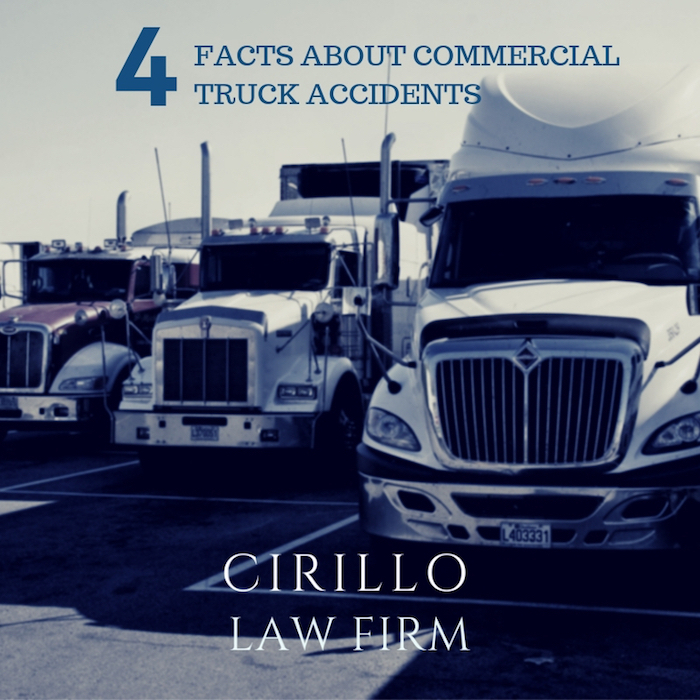 These are the four main facts to know about commercial truck accidents to ensure fair compensation and recovery.